The general process is mostly the same across all devices, but the files and exact steps vary depending if you are using a Sense or Google Play Edition device. Before getting started, I'd recommend reading this entire guide one time to make sure your device meets all the qualifications. Your HTC One MUST be S-Off. Root permission will also be needed if you plan on resetting the warning flags on your bootloader menu. In order to avoid any hiccups during file transfers, you will need to use a USB 2.0 port when connecting your One to your computer. 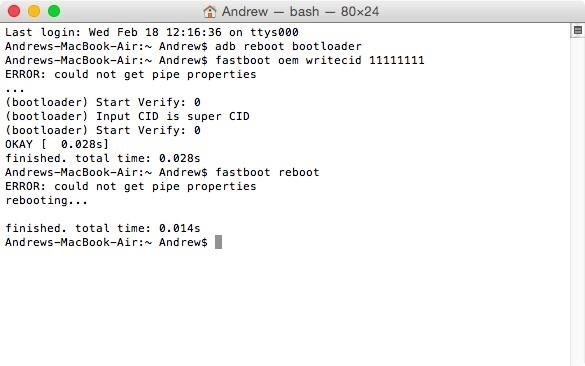 ADB and Fastboot will be need in order to send the install commands to your device. 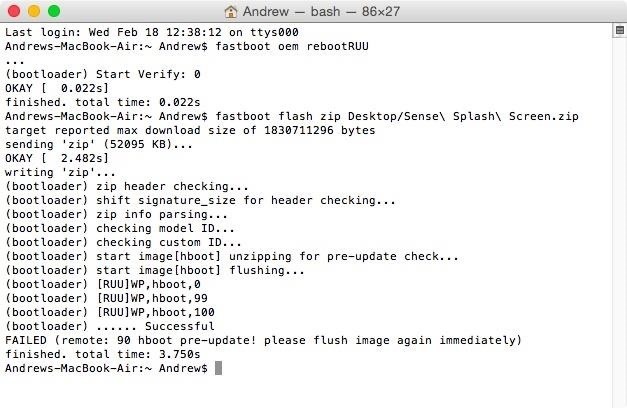 It does not matter whether you are using a Windows PC or Mac, just be sure that you are using the latest version of ADB/fastboot. Enable USB Debugging in order to send ADB commands to your One. It should go without saying, but this will completely wipe your device, so be sure to back up your pictures, music, and videos before starting. The Google Play Edition version of the HTC One M7 is fairly simple to convert back and forth between Sense and Vanilla Android, but that is not the case with the M8. Due to some system partition size differences, you must first flash a Sense firmware file before being able to go back to stock Sense. If you are using a converted M7, you can skip this section and go directly to "Reset Warning Flags" below. Once your device reboots, do not unplug it from your computer. If you needed to change your MID in order to flash the Google Play Edition RUU, you now need to change it back in order to flash your original carrier's ROM. 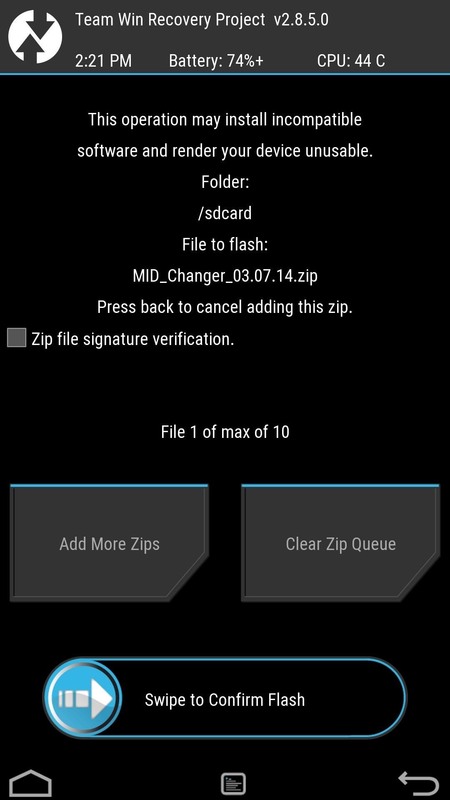 Download the MID Changer Tool, created by XDA user squabbi, onto your phone and flash it in TWRP recovery. To boot into recovery mode, press and hold down the power and volume down buttons until you see the bootloader menu. Under HBOOT, you will see Recovery, so select it with the power button and wait for TWRP to start. 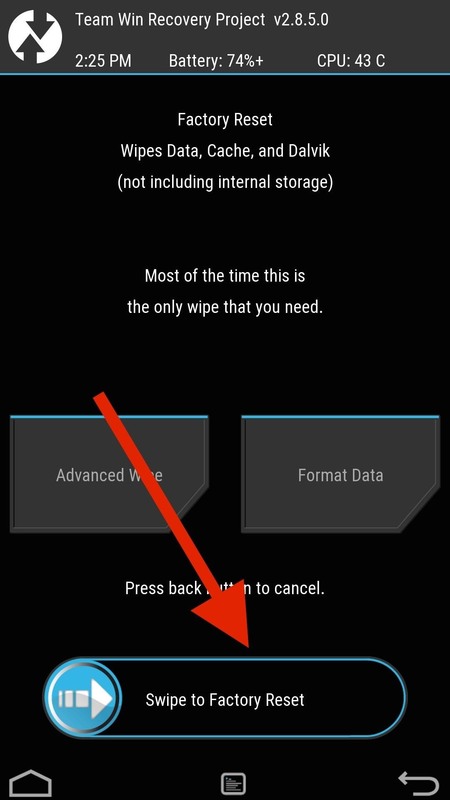 Once you are in TWRP, tap Install, select the MID Changer Tool file, and then swipe to install. The Aroma installer will then start automatically, so go through the warning screen and when prompted, select the carrier you want to revert back to. After the flash is completed, do not tap reboot—instead, go back to the main menu, tap Reboot and select Bootloader. Again, leave your device plugged in and at the bootloader menu once the command are completed. Your M8 is now running a Sense-based firmware, but it is still not partitioned correctly to accept the stock Sense ROM files, so you'll need to boot into the stock recovery and factory reset your device storage. Make sure that HBOOT is highlighted in your bootloader menu, then press the power button. From the HBOOT menu, scroll down to Recovery using the volume down button, then press the power button again. 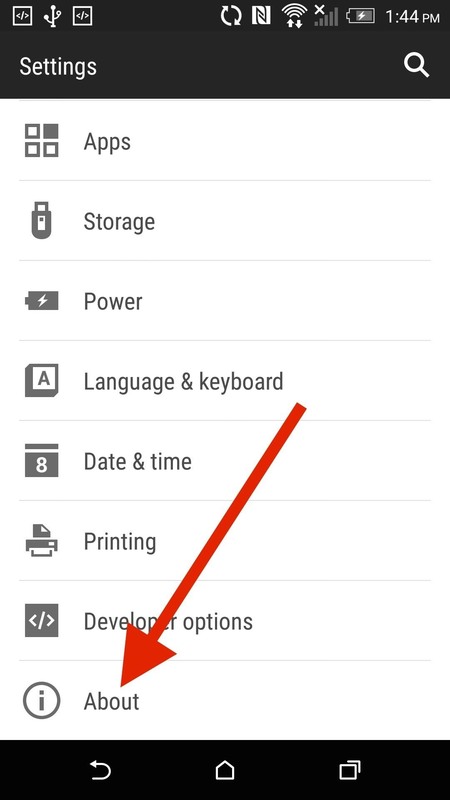 Once you see the HTC One with a red exclamation point, hold down the volume up button and press the power button. Scroll down to wipe data/factory reset, press the power button, and scroll down to the "Yes" option. After the reset is finished, select reboot to bootloader. The last thing to do is flash a Sense-based ROM so that we can eventually get rid of the warning flags at the top of the bootloader menu. 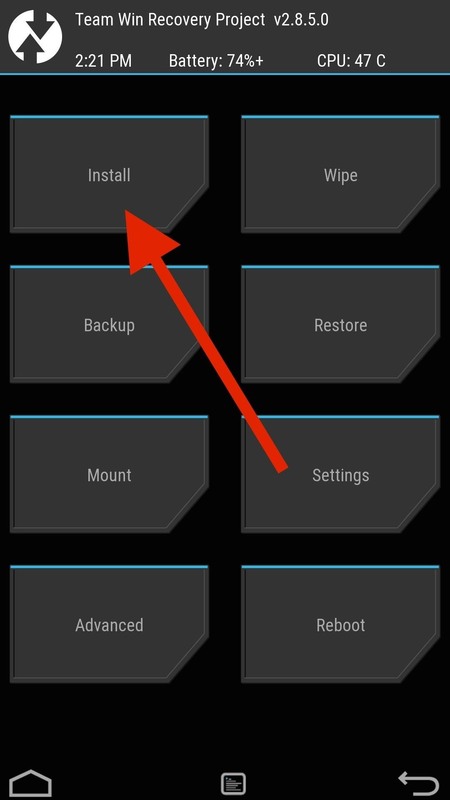 Now TWRP is installed on your device as a custom recovery, so use the HBOOT menu to boot into it like we did in Step 3. 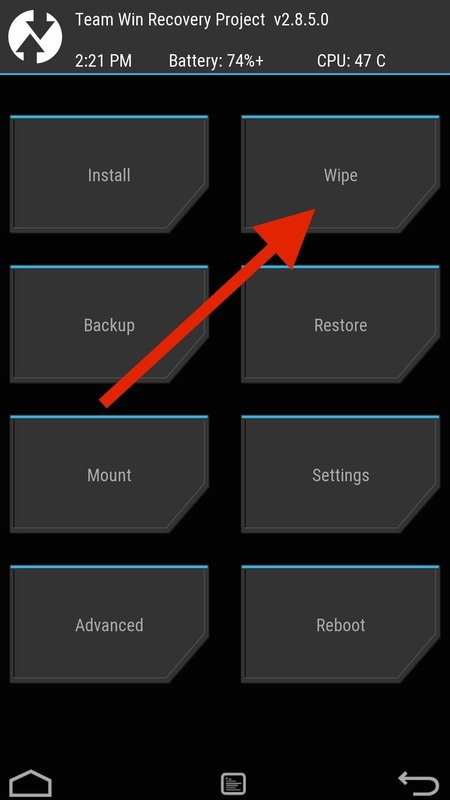 Once TWRP boots up, tap Wipe and swipe to perform a full factory reset. To install a Sense ROM onto your M8, I'll be using the latest ARHD ROM by Android Revolution HD. However, unlike traditional ROM installatios, we will need to sideload it since we do not have a ROM.zip file in internal storage. 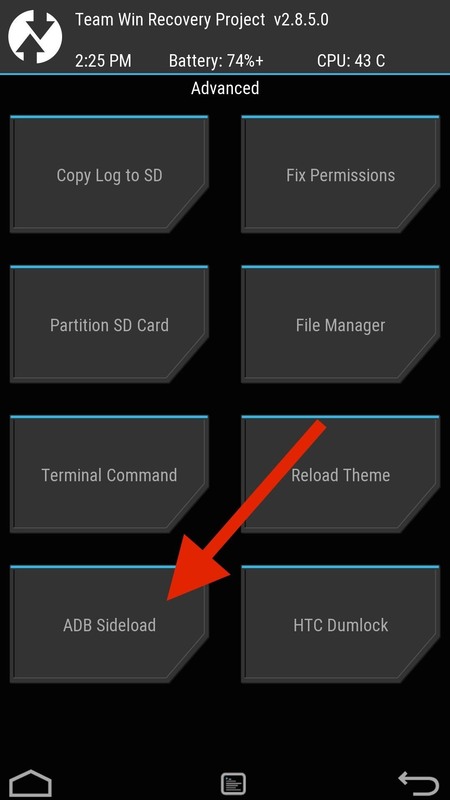 To start the process, tap Advanced -> ADB Sideload and swipe. You may also want to check the description of your ROM to see if there is an Aroma installer associated with the installation. If there is, make sure you keep your M8's screen on the entire time because if it locks, you'll have to start over. After the sideload is complete, tap Reboot, set up your M8 as if it was brand new, and enable USB Debugging. Your M8 is now running a rooted, Sense-based ROM so we can finally get started on returning it to HTC's factory conditions. The telltale sign that your device has been modified is the Warning Flags at the top of your bootloader menu. These either say something like "UNLOCKED" or "TAMPERED" and can prevent you from getting your phone serviced if you send it to HTC. In order to set those indicators back to their original state, you'll need to enter a few ADB commands while your device is booted to a Sense-based ROM. The commands vary between the M7 and M8, so make sure you are using the correct one. After the commands are issued, leave your One plugged into your computer and on the bootloader menu. Your bootloader menu should now only display LOCKED at the top. You now have a device that has no indication of being modified, but in order to get the software back to stock, you'll need to use a RUU, aka ROM Update Utility. The RUU installs all of the original, carrier-specific system files that shipped with your device, so be sure to download the file that matches your device exactly. Verizon M8 RUU.zip (courtesy of Dottat). Your One will now boot up as if it were a brand new device, so go ahead and enter your Google credentials to begin restoring all of your apps and contacts. 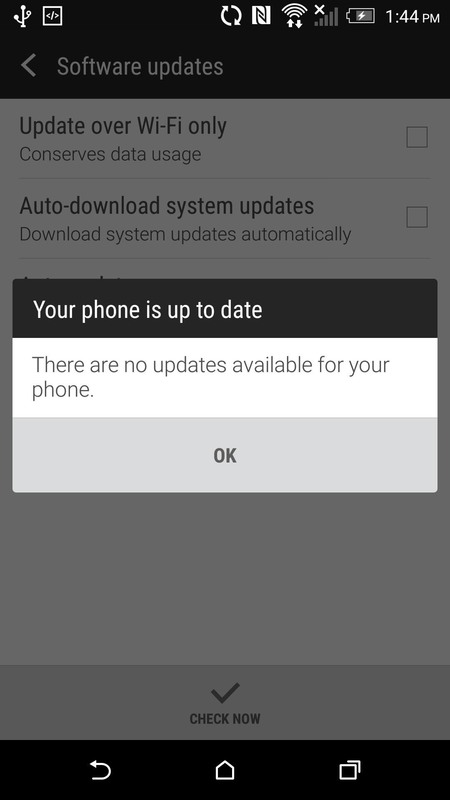 You will also need to check for OTA updates since some of these RUUs are outdated (Settings -> About -> Software Updates). It may take a few hours for updates to be pushed to your device, so be patient. OTAs will install just fine as long as you have an unrooted, unmodified device. And if you find yourself having any problems or are stuck at a particular step, be sure to drop me a comment below. Hi, I can't enter TWRP (step 7). It says "entering recovery" but it never does. Did you flash the right TWRP for your device? Hi! I got it work thru flashing a newer firmware. But now when i have don all steps and starting the phone after flashing a sense based rom, my phone just go back to recovery. Did you sideload ARHD in TWRP without errors? And what happened after you flashed it? It should read: "adb reboot bootloader" delete the space you added and it should work fine. You have to add the full location path to the command in order for it to locate files outside of the main C directory. If you place the file in the root folder of your hard drive the command will read "adb sideload C:/ROM.zip"
I'm come from SD GPE. Fairly new to this. I got a phone from a friend since I broke my phone but told me it's rooted and rom. I am connecting to my Sprint service and noticed I can't do any of the functions necessary to connect to service. How do I go about this without bricking the phone. I have TWRP 2.8.6.0 version on this phone. while installing it asked me to do FACTORY RESET and it always ends up in TEAMWIN flashing screen. Any help or direction would help. I already put phone in the system online. I do not want to go to a Sprint Store for them to say my phone is tampered with. Can you guys help? thanks so much. What is the phone's original carrier? Hi, can I flash the twrp without root and without unlock bootloader but it already s off and change to super cid. Can I convert my att to gpe with method above. You need to have an unlocked bootloader in order to flash TWRP. 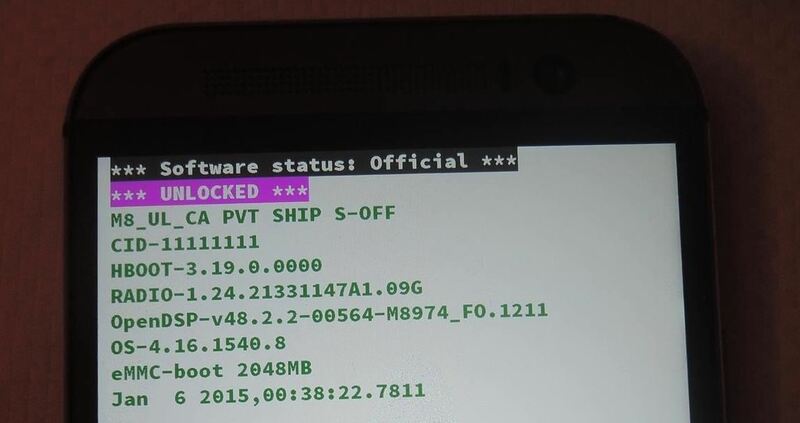 The status on the phone reads "RELOCKED"
You cannot flash TWRP with a relocked bootloader. Unlock it and try again. 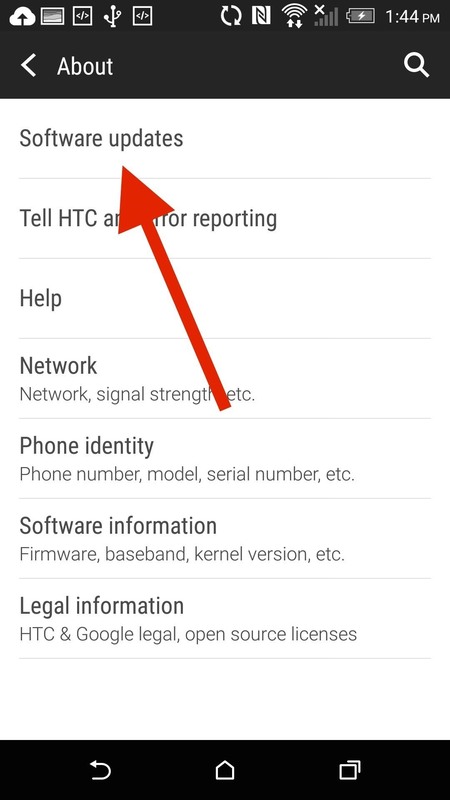 The commands are only for HTC ONE M7 & M8. Can you please provide the commands for HTC ONE E8. whats the ruu i should flash ??? the developer version one ??? in Step 5 after i factory reset my phone, i dont have the option reboot into bootloader... help me please!!! whats the ruu should i flash ??? I have difficulty sending command from my macbook to the m7. Installed the adb/fastboot as instructed. Here are all details abt both Mac and m7 that might help deduce problem. Sync Manager is Installed on mac book. Hboot is version 1.44, twrp is version 2.4.4, runs on custom ROM, boot loader is tampered and unlocked. Can someone please repost a link to the Sense firmware? The current link is broken and every other version I've tried fails when I try to flash it. Thank you. Useful guide however I had to use a 5.14x series firmware and then install a kitkat RUU otherwise the RUU would complain about being too big (might have something to do with previously convert to GPE/Back to sense). Hi, I'm new to android and I just purchased HTC one M8. I would very much love to get Android 6.0. The bootloader is LOCKED but it is currently showing S-OFF and i tried the command on the setting the S-On page but its not working. Any updates I tried installing tells me my HTC is modified. Any help please? Thanks a lot for the lovely article. Kizi 2 really appreciate it.